The NBA draft is over and it’s time to start projecting the rookies and their potential fantasy impact for the 2011-12 season. Analysis: We shouldn’t have high expectations for Kyrie Irving this year especially after John Wall spoiled so many of us with 16.4 PPG, 8.3 APG, 1.8 SPG and 4.6 RPG. Like with so many rookies Irving will be taken in re-draft leagues well before he should. The hype machine will tout Irving as nearly a twenty point per game player and he’s just not capable of that his rookie year especially with the complete lack of talent on the Cavs. We also have to consider Irving’s playing time. Baron Davis and Ramon Sessions are still on the roster and they both averaged around 13 PPG with 6 APG last year. What the Cavs do with these point guards remains to be seen, but Irving is splitting time with one of these guys this coming year. We can expect nearly thirty minutes of playing time from Irving this year but his durability over an eighty-two game season is in question. Projection: Kyrie Irving isn’t going to light the league on fire or become the NBA’s next elite point guard like the hype machine would have you believe. His 2011-12 season should be 15 PPG, 5-6 APG, 3.5 RPG, 1.5 SPG and about one three pointer made per game. Think Mike Conley type numbers not Steph Curry. Sunday night was the deadline for college basketball stars to submit their names to be considered for the NBA draft. Some have already withdrawn, opting to return to school, others may as well by the June 13th deadline. With uncertainty due to potential NBA labor strife, a surprising number of top players decided to forgo the draft. At the same time, others that will go undrafted, opted to hire agents, giving up their college eligibility. In advance of the draft, a combine will be held in Chicago next week. 54 players will undergo physicals and interviews with prospective teams. Players will also have the option to participate in drills if they so choose. Historically, those invited to the combine are drafted, so the list is a fairly good peak. With no natural centers leaving early, expect international bigs to get attention early. The NBA Draft Lottery will be held on Tuesday night at halftime of the Western Conference finals. In order, Minnesota, Cleveland, Toronto, Washington, Sacramento and Utah (from New Jersey) have the greatest chance of picking first. Seven teams will have two selections in the first round. Cleveland, Utah, Washington, Charlotte, Minnesota, Houston and Chicago have an extra pick due to trades. 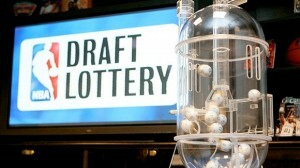 The 2011 NBA draft will be held on Tuesday, June 23rd at the Prudential Center in Newark, NJ.